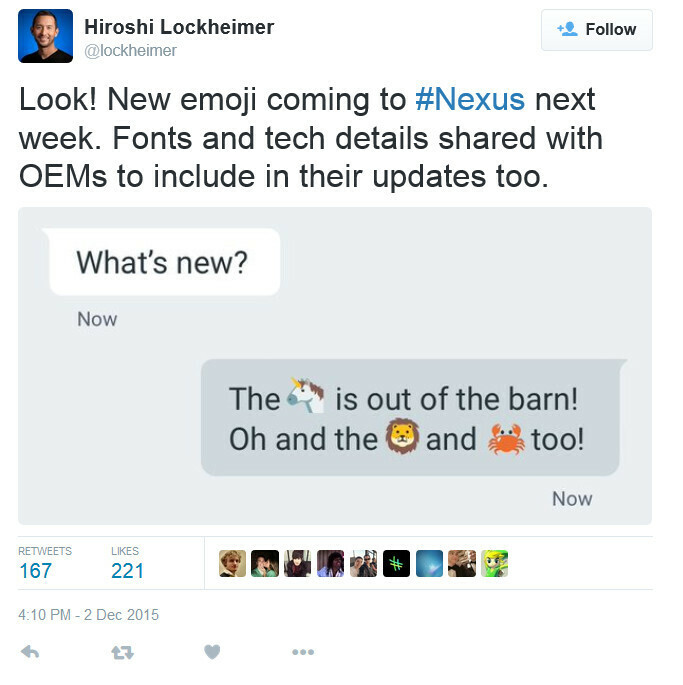 Earlier this week, senior VP of Android Hiroshi Lockheimer spilled the beans that Nexus devices will not only receive a handful of new emojis, but also a system update with a new keyboard, a fresh new font, and probably something else, too. All of this will be courtesy of an update to the Unicode standard. Unicode 8.0 will deliver the fresh new goods. The more memorable of you probably recall that Unicode 8.0 was adopted by Apple more than a month and a half ago, when iOS users were treated to a hefty amount of new emojis alongside iOS 9.1. Well, many of the new emojis that are set to arrive on Android are quite similar to the iOS 9.1 ones. Prepare to send taco, burrito, champagne, popcorn, and middle finger emojis to your friends! How do we know that? Well, Reddit user d0t1q noticed that the desktop version of Google's Hangouts has had its static content updated from v5 to v6. A script was then used to pull all emojis from the new version, and these were compared with the older, v5 emojis. Ta-da, the newcomers are no longer a secret. You can check them out in the gallery below, but have in mind that they are of lowly quality. Also have in mind that this is no official info. iOS has the best looking emojis hands down. Emojis on TW would come second. How will people with older phones be able to get these? Other than by getting a new phone. Will they be downloadable to 4.4 phones? Glad I'm finally going to get useful updates on my Nexus 5.
when can we stop using the lil yellow turd emojis?? it would be nice if that was the big surprise, no more yellow turds!